A worldwide established clubwear brand since 2008, based in the UK. A maker of custom made clothing, dancewear, fancy dress and kids clothing. Formerly known as FetishB*tch aka FB Clubwear. 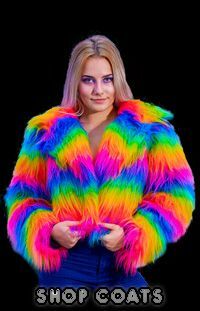 Here at Funki-B, we manufacture and design all our items in-house, led by a small team of hardworking, dedicated, and funky fashion designers. We can also bring your own creative ideas to life and customise our products to suit your needs. Whether you're on the lookout for a cute club outfit, a Halloween costume, custom-branded dancewear, children's casual wear, an out-of-this-world fantasy outfit or something completely unique, Funki-B is here to help! We design and make all our clothing in our UK studio, and the only limits are the ones captured in your imagination. We aim to answer all emails daily. Just get in touch and we're sure we can create you the perfect outfit for any event, from casual to far-out!